Do you need to be an entrepreneur to be a leader? It might help, but it’s not mandatory. In all honesty, being an entrepreneur does little to help you become a better leader. Leadership, when boiled down to its basics ingredients is based on your ability to influence people. If you can’t influence your team, then you can’t lead your team. Influence or in my case the lack thereof was a lesson that I learned the hard way. Early in my career, I thought I had to be smarter and better than everyone else to be a good leader. I was painfully wrong, and that attitude only served to drive a wedge between my team and me. Let’s read what else McGraw has to say about becoming a good leader. 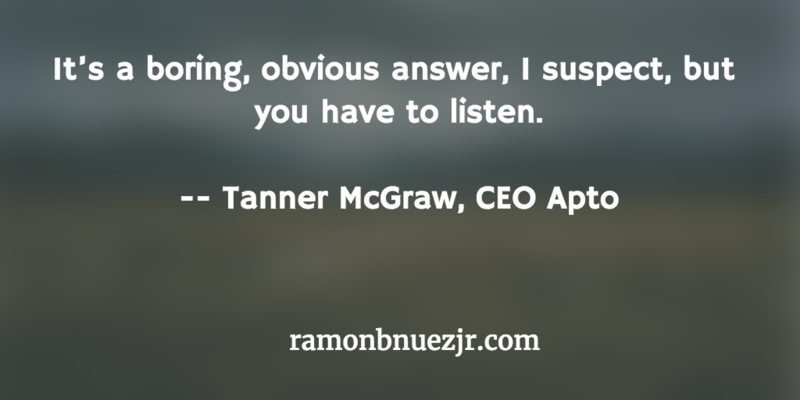 By the way, I love Tanner’s response to the last question – all leaders should do this. So Tanner, what's your story? I've always had an entrepreneurial spirit, which was instilled in me by my family. I got into commercial real estate brokerage after college, fascinated by the built environment. Our industry has been behind other more mature industries when it comes to technology and it didn't take long for that to become a personal challenge in building a business. I tried implementing the various CRMs that were available for the commercial real estate industry but couldn't find anything that worked for my business. Out of frustration following our third implementation, I decided to build my own. My business was established at that point and there wasn't any intent to take it to market but after receiving an abundance of interest, Apto was born. Starting my own company has been both terrifying and thrilling…a really fantastic journey so far. We've had great momentum in the last couple of years, and we're ready to shake up the status quo in the industry! Why should leaders lead? And when they do, what is their first responsibility? It's a boring, obvious answer, I suspect, but you have to listen. Being more of an extrovert, my natural tendency is to talk first, listen second. It's an area I have to pay attention to but it's crucial. 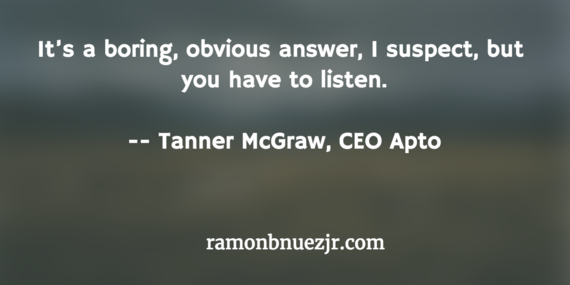 I think too many leaders rely on limited input or their own notions to drive decision making. In a way, I tend to crowdsource our go-forward. We've got incredible people--each with a unique viewpoint. In aggregate, there's an amazing, earth-shattering strategy in there. It's my job to distill that down into the right one. How does a leader build trust? Self-awareness is a distinct opportunity for leaders to develop trust. Most people have blind spots. It's part of the human condition, it seems. Acknowledging and working to fix those blind spots is a habit, not an accomplishment--and often very difficult to do. If leaders can master that habit, and be genuine in their own improvements and transparent with their teams in the process, it seems to drive an alignment and trust that is otherwise hard to accomplish…and integrity and honesty and all that other stuff. How are you making things better for the people who follow you? Iron sharpens iron. Personally, it makes my efforts extremely enjoyable when I am surrounded by people who are uniquely intelligent, vigilant, driven-yet-humble and naturally curious--and who regularly challenge me. We work to provide an environment that celebrates those things to help people elevate. We have also worked hard to create a common-sense culture that removes obstacles that inhibit success. What are you currently doing to develop your leadership? I read a lot. I just started a book on Intel's management philosophy that came out of my research on their development of OKRs in the 1970s. I'm a big fan of understanding how other successful leaders think and operate--and looking for the common threads. If I sense a gap in my own approach I've always worked to develop towards those skills. Jim Collins' books (Built to Last, Good to Great) have taken a similar approach and distilled public company success into digestible concepts. Read also: For People Who Are Following Their Passion, Stop Now And Do This Instead.